A pig’s gestation period is 3 months, 3 weeks and 3 days or 114 days. I am well acquainted with this knowledge because I am about to experience for first solo pig birth. And it’s like Christmas for me. 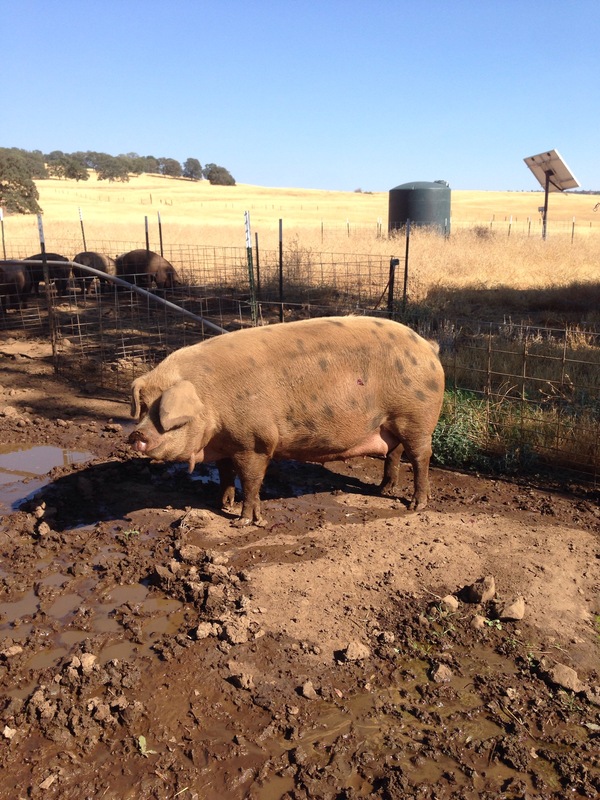 My very first sow, M-pig is due next week with her first litter. As you all recall, I’ve been anticipating this day since the end of May! Yes, I took a video of M-Pig and her boarfriend. All summer I’ve been extra careful with her diet and care. I’ve spent a lot of time with her, giving her attention and lots and lots of brushes and baths. I figure, if this pig really likes me, she’s not going to care too much when I assist her with her birth because she’ll trust me. 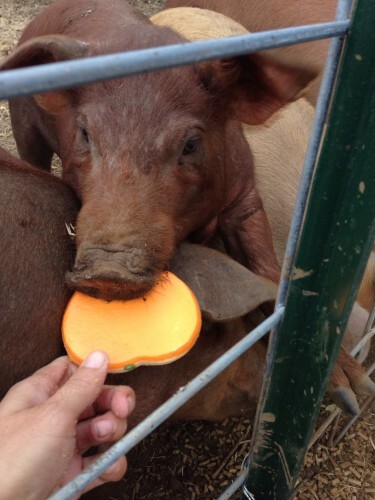 I’m also looking forward to having a ranch day or two so my clients can meet their meat and I want tame pigs and piglets. This week I have finished my “pig birthing kit” and worked on M-pig’s bedroom. I’m pleased to report I am pretty much ready for the blessed event. I’m watching videos on youtube, talking to my experts and reading books. I almost feel like it is a whisper silly that I am so nervous about one pig giving birth! I spent the whole summer watching and helping a couple hundred cows do it, so this shouldn’t be that big of a deal for me. Remember the Montana Cowboy? 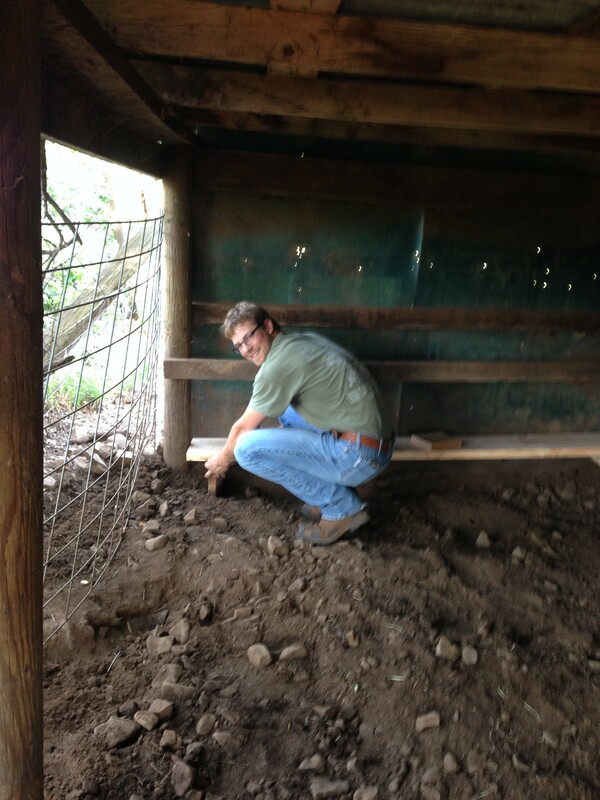 He helped me install some bumpers so the piglets have a place to hide from Mom. I am doing the birth the “natural way”. That means I am not using a farrowing crate. A farrowing crate is a small pen that keeps the mama sow from rolling over and squishing her babies. My gilt is pushing 600 pounds, she couldn’t feel herself roll over on her babies even if she tried. I’m not using a crate for a few reasons. The first being I can’t afford it, pretty much all my money is going into buying more pigs. The second is since I have the time, I plan on being with M-pig during and after the birth. This will hopefully mitigate any loss until the piglets can figure things out for themselves. I do realize that I do face increased piglet loss by this choice, but I am going to try it and see how it goes. 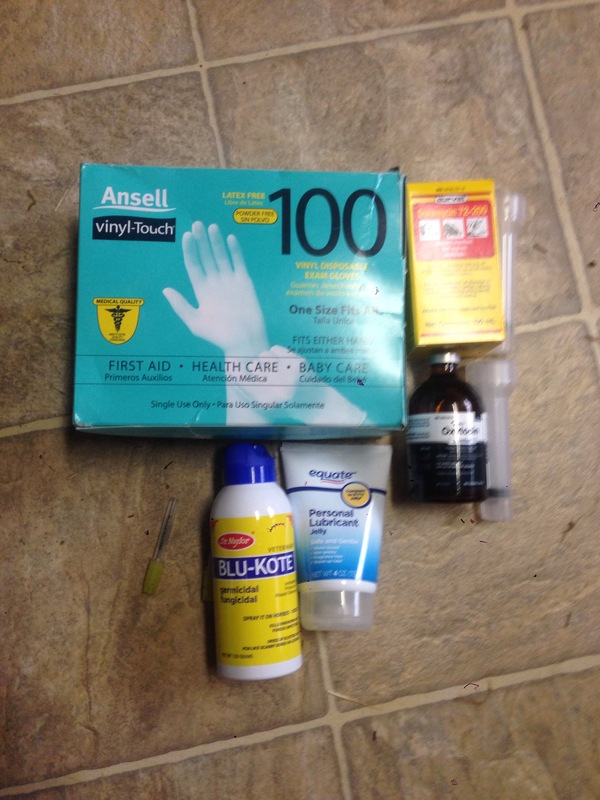 My farrowing kit. My vet helped! I’m excited and proud of myself that I have reached this point in my hog operation. Honestly, I never thought I’d ever own a sow, let alone farrow one out! I’m getting ready to purchase a boar and build more pig pens, so I can keep expanding! Hopefully next Wednesday, my Wordless Wednesday will be cute, newborn piglets! Stay tuned! If you are into “clean” eating, low calorie, or unprocessed food, move along, nothing to see here. However, if you are into delicious snack food, that brings you a great sense of joy and happiness, you are in the right place. Chex mix has always brought me inner food peace. 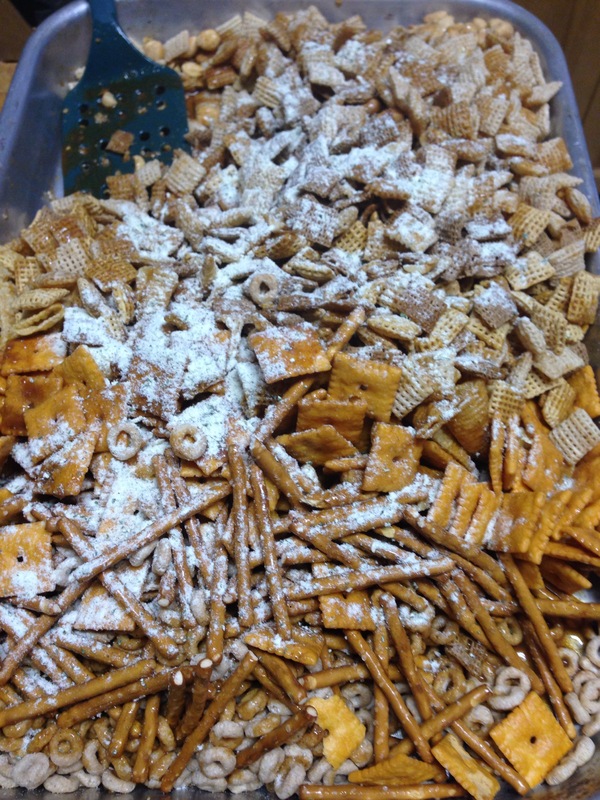 From my Great Aunt Mary’s mix as a child, to the stuff you buy in the store, I have never met a chex mix I didn’t love. Whenever I have felt ill or not hungry, chex mix can usually be counted on to make me feel better. If I am ever on death row, this will be requested as part of my last meal. Oh, chex mix, how I love you. Lately I have been on a huge Chex Mix kick. I’ve been making about a batch a week. My friends are getting care packages of it. Every time I make it just a whisper different. 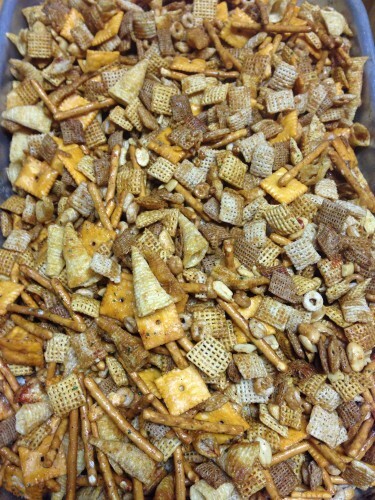 You see, that is the beauty of making your own chex mix. You can do anything you want! You can add your favorite things! This is currently how I am making my favorite batch. Don’t make it all pretty like this, just dump it in a big pile, it makes it easier to mix. I did this purely for a pretty photo. 1. Preheat your oven to 250 degrees. 2. Melt the butter. Add the next 7 ingredients for the sauce to your melted butter. 3. 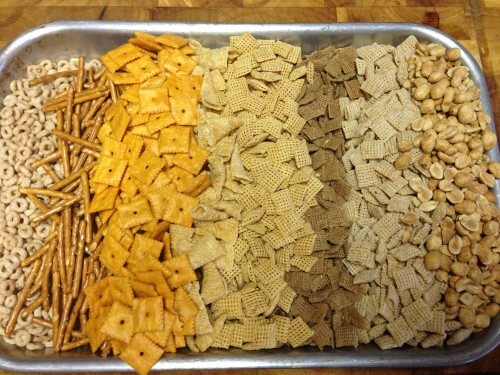 In a large 9×13 sheet cake pan, mix together all 9 of the cereals, nuts and chips. 4. Toss “the sauce” and “the mix” together until coated. Be gentle, as you don’t want to crush your cereals. After everything is coated, open up your ranch mix and gently sprinkle that over your sheet pan, gently toss again. Step 4: the dry ranch mix being incorporated. This is an important step, don’t skip it! 5. Bake for 1 hour, stirring the mixture every 15 minutes. 6. Store in an airtight container, that is if you have any left. Again, Friends, use this recipe only for good. It has great and powerful juju. It is also perfect for Ranch Days, soccer games, movies, Super Bowls and field trips. As you know, we have fig trees. However picking those figs is a whole other story. Between the deer, birds, my pig, and our neighbor Pete, it’s tough to get a good crop. However this year I persevered and picked enough to make jam. But not any jam, this jam is pure Table Mountain Ranch. It uses both ranch fruit and ranch honey, a marriage made in heaven! 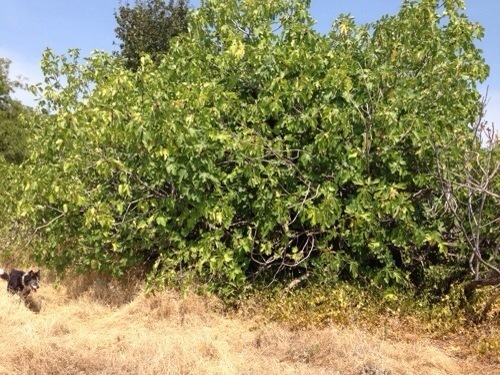 This is what a mission fig tree looks like. 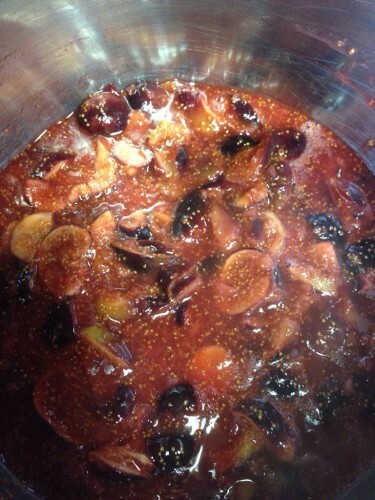 Washed, stemmed, and chopped figs. Wash and de-stem your figs. Chop finely. Add the figs, lemon juice, and water in a large saucepan. Add pectin and stir until combined. Bring the mixture to a rolling boil, stirring often. When the mixture has reached a full roiling boil, add the sugar and honey. Boil hard for one minute, stirring constantly. Skim foam, and ladle into processed jars leave 1/4 inch headspace. Process for in a boiling water canner for 10 minutes. This is delicious, I swear! In honor of “sneak some zucchini onto your neighbor’s porch” night, I thought this would be a good time to share with you my latest new favorite thing: zucchini pickles. I know, I know, at this point in the summer you are tired of squash. I was too, until I tried these! Neighbor Pete told me his Mom used to make pickles out of zucchini and they were delicious. I was hesitant to say the least. But since he gave me several pounds of zucchini and a couple of onions from his garden, I decided to at least try! Guess what? They were amazing. I couldn’t even tell they were zucchini pickles, they tasted and had the texture of normal cucumber pickles! If you have a bunch of extra zucchini (who doesn’t, amirite?) I highly recommend you give these a go! Soaking in salt ice is an important step, don’t skip it. Soak the zucchini, onions, and salt in an ice water bath for two and half hours. Rinse in cold water. Invest in a cheap mandoline, it is worth it for the beautiful, uniform slices and not stitches! Bring the rest of the ingredients to a boil. I let it boil about 5 minutes. Put about half of the rinsed zucchini and onions in the pickling mixture to scald. Then place in sterilized, hot jars. Do the same with the rest of the zucchini and onions, making sure to pack them tightly and to remove air bubbles. Adjust your lids and process in a hot water bath for 10 minutes. Glorious, glorious bread and butter pickles! Let them “pickle” for about two weeks to really get the full effect. Also if you are a fan of spice, add some peppers in there! I’ve been adding jalapenos into some jars and it makes the pickles even better! One of the amazing things about farmers and ranchers is solidarity. We will always have differences of opinion about everything, but when push comes to shove, you’ll never find a group of people that are more supportive of each other. This becomes apparent to me every time agriculture has a serious event like a drought or a major storm. As we know, the western United States is suffering from an epic drought. The networking, and information being shared amongst our groups right now is staggering. The messages of support and advice I’ve been receiving has blown me out of the water (sorry, bad pun). Carin has been one of those people that has offered her support. Like me, she is passionate about her way of life and ranch. She has graciously shared with me a post about her experience with our drought. Please take the time to follow her blog here. Thank you. 93432. Creston, California. It’s a tiny little slice of heaven most folks have never heard of because we boast a population of 240 according to the sign at the NorthWest edge of town. We only have two paved streets. One is Highway 229, or you can head south on O’Donovan Road. I grew up in a log cabin my parents built about a mile and a half down O’Donovan Road. My Dad’s family has been here since 1874 when Patrick O’Donovan, an Irish Immigrant, settled here. Noel & Nancy Ryan. Married 40 years. Nancy grew up as a farmers daughter and one of 5 children. Her fathers family settled in the Paso Robles area in the 1860’s. Noel was raised on his family’s ranch established in 1874 by his great grandfather. Creston doesn’t have much. We do have a church, elementary school, rodeo grounds, steakhouse, post office, dive bar – all the essentials. And water. We have water. The greater Creston area parallels the beginning of the Salinas River Valley. The branch of the Huer Huero River that skirts our property is a tributary to the Salinas River. It’s dry for years at a time requiring steady, heavy rain for weeks on end or several wet years in a row in order to flow water. On a few occasions and only during tremendously wet years, the river has overflowed its banks and rerouted down our driveway. A good excuse to stay home from school when we were kids!! It’s a Sunday night and I sit on my parents back patio with my Dad. It’s 100 degrees at 7:00 pm, down from 106 earlier. Typical summer weather. Hot days and cool nights make for great growing conditions for wine grapes. In the last 30 years, the Paso Robles AVA, which Creston is a part of, has seen numbers jump from 5 wineries in the late 70’s to nearly 300 tasting rooms, probably thrice as many individual grape growers, several custom crush facilities and countless other businesses directly related to grapes and wine. Wine has been good to us. Good rain years, grass gets about a foot tall, up to 3 feet in the good spots. This is April which is about the end of our rainy season. Dad remembers the wet years and the dry ones. He can name them off the top of his head. 1958, Dad and his brother swam in the creek in front of the house in May – long after the rainy season had passed. 1969, he was in a leg cast and dating my Mom. Grandpa would pick Dad up at the end of the driveway in a tractor and haul him to the top of the hill to get Mom. It was so wet he couldn’t drive his car up their driveway. I was born in May of 1978. A friend had a helicopter on standby to get mom out in case it was too wet to drive to the hospital when she went into labor. The early 90’s were bone dry ending in the March Miracle in 1995. Dad will tell you that 2011 – 2014 have been the driest he remembers. Our average is 13″. We haven’t seen 10″ in the last 3 years combined. I grew up knowing that just 5 miles from us in three directions were areas of land that had terrible water – quantity and quality. We’ve sold water by the truckload to folks that live in those areas, from our ag well for as long as I can remember. Some of those folks abandoned their wells completely, years ago. Add 10 miles to that radius and I can name 5 areas outside of Paso Robles where subdivisions went in, everyone had their own domestic well and leach field on their own 5, 10 or 20 acre lots. Old grain land which used to be dry-farmed and grazed with cattle and sheep was gobbled up by folks moving to the “country” from the big cities 250 miles north and south of us. As the wine industry grew, more land was absorbed, wet years, dry years, wet years again and more vineyards were planted. As of late, some large corporations, either wholly comprised of wine and wine grapes or having large interests in the wine industry, saw the writing on the wall in the Napa Valley and bought up Northern San Luis Obispo County land, largely made available as a result of the economic collapse. They installed vineyards at a record pace. Hard to blame them. A savvy local reporter revealed that one of these corporations is active in water banking in the San Joaquin Valley. This bit of information raised the hackles of some of the locals and, as they say, the fight was on. During our record breaking drought of late, wells that were installed in those Paso Robles Sub Divisions started failing and going dry. Folks took to their computers, wine in hand, and lobbied locally to form water districts so that the big corporations would be held responsible for the well failures. Farmers and ranchers were wise to counter. They formed their own groups. Now we have PRAAGS, PRO Water Equity, an individual who is filing for overlier rights on behalf of landowners. And then we have the politicians. A quick thinking North County Supervisor immediately omitted two towns and the City of Paso Robles from the areas to be affected by the initial Urgency Ordinance passed by County Sups to stop the bleeding. (Note: the City of Paso Robles is undeniably the largest user of water in the basin – without argument.) The Chairman of our County Board of Supervisors (his district does not include one ounce of water in the Paso Robles Groundwater Basin) sent errant letters to State Elected officials full of lies and inaccuracies. We have a state Assemblyman filing for legislation that lays the groundwork on how to govern the water district that has yet to be approved by LAFCO. I sat in his office and he told me, to my face, this legislation doesn’t form the district. I do not believe him. The 5 heifers we kept. Let me be clear. In this crowded groups of litigants, politicians and groups promising to be in my family ranch’s best interest, I don’t know who to believe. I believe the rain gauge when it said we got ±5″ at the ranch, more than doubling the two years prior. I believe my Dad when he said we had to reduce our cattle herd down to 10 females because our unit per acre ratio (usually 1:25 – 1:50) was, at best, 1:100. 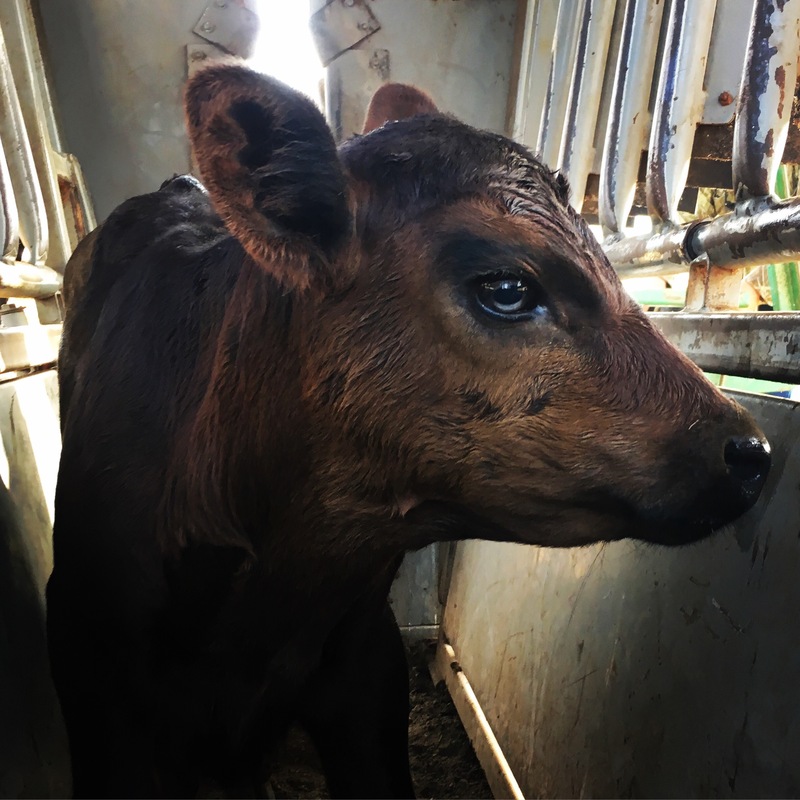 I believe the quivering chin and tears on my Mom’s face when she gets back from her usual favorite activity with Dad – a Jeep ride to check the cows. She cries because there is no grass, no water, little hope. Checking cows now takes about 15 minutes and is hardly the romantic endeavor she used to enjoy. 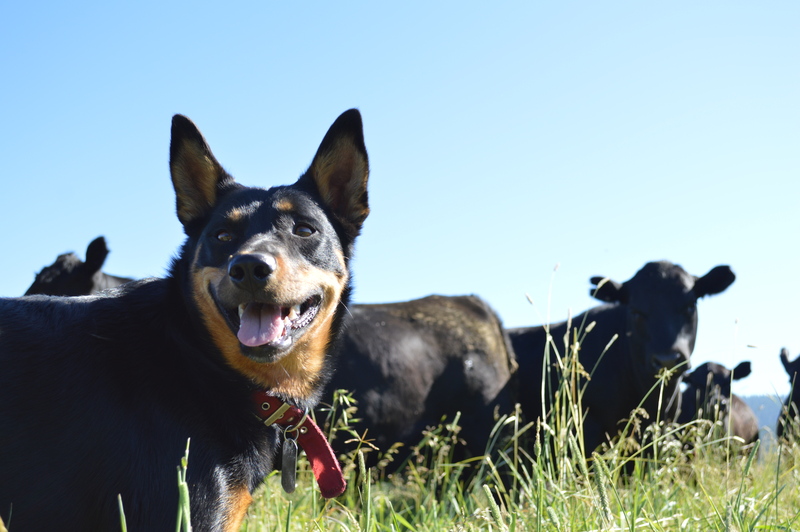 She and Dad would share memories, discuss important topics and dream of their future, all while taking pride in their herd. My parents are blessed with good water, and they know it. Our ag well pumps 400 gallons a minute and does not waver. Our domestic well that feeds two houses is set at 60 feet. Sixty. The ag well provides water to our longtime customers, fills our reservoir and was formerly used to pump water for our alfalfa hay operation. We abandoned the hay business when Dad didn’t have enough time and we weren’t old enough to help. The water never left. Dad tells a great story of he and my youngest brother in the field down below the house the middle of one summer. There’s a small, abandoned well shaft. Dad showed my brother the casing. My brother dropped a rock down the casing to see how deep the water was. They heard nothing. My brother bent down and put his skinny arm down the shaft. He was wet up to his elbow. We had standing water at about 18″. Looking north across our pasture. The green is our neighbors vineyard. It was planted probably 15 years ago and is thriving. It has had NO impact on our water levels. I had the privilege to listen to DeeDee D’Adamo of the California State Water Resource Control Board during our May, California Women for Agriculture meeting, speak about State water issues. Most the questions were about pending Bond measures to fund more State Water projects, the Delta tunnels, and so on. I stood up in front of my peers and asked her directly about what was happening in the Paso Robles Groundwater Basin. She didn’t really answer my question and only said she’s very interested in what’s happening here. 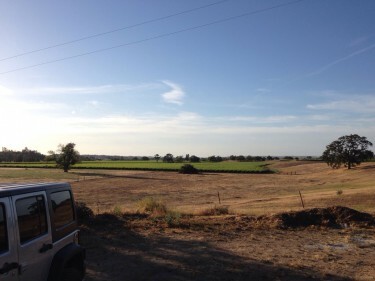 She’s interested because what happens in Paso Robles and its surrounding areas will be echoed all over the State of California in areas where the water isn’t adjudicated. If you think that because you have water under the property you own, and you are entitled to a well and that water, you may be right – but not for long. What happens here, won’t stay here. What’s happening here is the answer to politicians desire to control every drop of water in California. Some of the Paso Robles water groups are for water districts because they’re against water banking and private entities selling water outside of our basin. Our family is part of the water-blessed. We fear that if this district is implemented, what will stop the State of California from pumping the water from my family’s well into the pipeline that already runs through our ranch, and selling it to someone else? If you come to dinner around our family table, you will say a Catholic Blessing. “Bless us oh Lord, and these thy gifts, which we are about to receive. From thy bounty, through Christ our Lord, Amen.” Dad will pause, then close The Blessing saying thank you to the God that has given him so much. Then he humbly and quietly asks God to bring us more rain. I also believe that if God answers Daddy’s nightly prayer and brings us enough rain to end the overdraft in the Paso Robles Groundwater Basin, much of these passionate debates over water will be yesterday’s news. I believe we have a water problem. The problem is that not enough rain and snow fell from the sky in the last three years. Regulation and new governing bodies are not the answer. Because dissolving government agencies and removing regulation is like trying to un-ring a bell. As I told a friend in a heated Facebook debate on the subject of water: You can have my family’s water but you’ll have to buy it, one truckload at a time. And then I offered her a glass of whiskey. Like the majority of Americans, I have a Facebook page. As most of us know, Facebook offers groups you can join. There are groups for everything, I belong to everything from teacup pigs owners groups to stuff your own sausage groups. One of my favorites these days is The Cult of Pre-Pasteurian Preservation and Food Preparation, moderated by Ken Albala. A few months back someone in the group was talking about salt cured eggs and how delicious they were. I decided I needed to try them! Egg yolks buried in delicious truffle salt. I buried the yolks in a layer of black truffle salt, then a layer of regular sea salt. I left this alone, covered, in my refrigerator for two weeks. After the two weeks were up, I knocked as much salt off as I could, wrapped the yolks in cheesecloth and hung them in my fridge for another week. I had been dying to try these for months at this point and finally got the chance on a green salad. You literally must use a cheese grater to use these eggs, but it is worth it! The eggs could also be served over pasta and other vegetables. Once your egg yolks are cured, keep them in an airtight container in the refrigerator for about a month. *Also you can use regular chicken eggs and salt. I was just being extra fancy.